Description: Date is approximate. Anyone know what the star on the side of the cab under the number signifies? Description: Going away view of eastbound CR 6331, 8012 and 6439 at Columbia. PA. Description: The West Shore was also a water level route, handling the freight across from the famed passenger line on the other side of the Hudson. Here we see a trio of SDs working a pig train north at Iona Island. 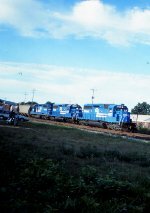 Description: ConRail's OIBU westbound at "BD" cabin on the old Erie Southern Tier route.